Formed in 1984, Micro Anvika is now one of the most prestigious retailers of computers and related products on London's famous Tottenham Court Road. In addition to their four shops on Tottenham Court Road, they have branches in Croydon, Manchester and Selfridges on Oxford Street. Micro Anvika have a number of other service related divisions including Mail Order Sales to consumers and corporates and also a Service Department. The web site is a particularly important part of their selling activity. PRIAM have provided the software for all their activities, shops, mail order and e-commerce. 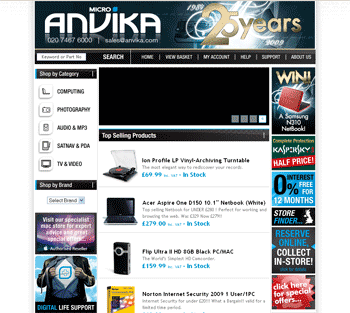 Micro Anvika are currently working on a redesign of their website. The new Micro Anvika site will be built using PRIAM appease as its CMS (content management system).